Metal working fluids in dilution with water facilities cooling and lubricates the Metal-Tool interface to improve the productivity. 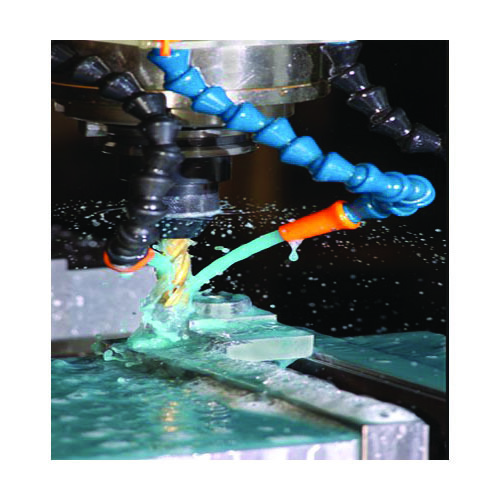 These are essential fluids for all machining operations like cutting, drilling, milling, grinding etc., to provide process improvement. BIOCOOL-100P is high performance environment friendly, long life semi-synthetic metal working fluid, suitable for all moderate machining and grinding operations on all ferrous and its alloy metals. Formulated with high performance extreme pressure additives, corrosion inhibitor package and biocide, BIOCOOL-100P is designed with high base oil contents to have good lubricity, residual oil on machine beds and quick separation of tramp oil in coolant tanks. WS-40HW is water-soluble, enriched with cationic surfactants for moderate machining and grinding operations on all ferrous and non-ferrous metals. It is formulated with refined naphthenic base oil, corrosion inhibitors, biocides and special emulsifiers to perform well even in high hard water (1000 ppm). WS – 600N is economical and environment friendly, long life water-soluble oil, suitable for all moderate machining and grinding operations on all ferrous and non-ferrous metals except titanium and magnesium. Formulated with refined naphthenic base oil, natural emulsifiers, corrosion inhibitor package and biocides.